I had wanted to visit the Chapel Royal, adjacent to Dublin Castle, since learning about its architectural beauty in an evening class I sat in but the previous time I tried, it was close for restorative works. However, when chatting to a friend following my detour to photograph Lady Justice, I was informed that it has since reopened. For a relatively cosy chapel, its Neo-Gothic interior is very impressive. Beautiful stained glass panels, opulent Rococo stucco adorning the ribbed vaults to the sides, handsome oaked upper galleries; definitely worth visiting. What caught my eyes among the splendour this afternoon though, was the bounce of sunlight into the chapel against the pews. 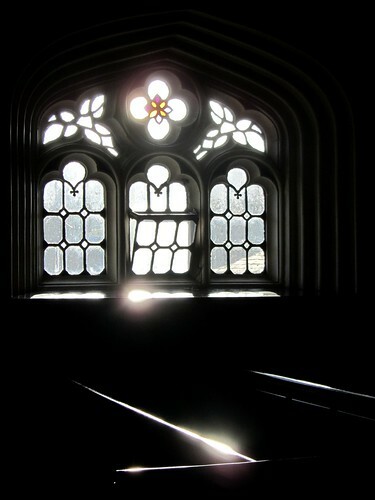 It gave the chapel a feel that is almost ethereal, serene. Until the next tour group arrives.